"Sodium thiosulfate" is treatment for poisoning, and scabies. It is also used in gynecology. The drug removes toxins from the body, has anti-inflammatory, antiparasitic, protivosudorozhnoe effect, prevents the appearance of allergic reactions. Instructions for use "Sodium thiosulfate"
"Sodium thiosulfate" is assigned in cases of poisoning by lead, arsenic, mercury, bromine, hydrocyanic acid, salts of iodine, Allergy, neuralgia and arthritis. It is used in gynecology for the treatment of infertility, elimination of cysts in the ovaries. The drug is also used topically for scabies. "Sodium thiosulfate" produced in the form of powder and solution for intravenous administration. This drug is not there are forms for intramuscular injections. In case of poisoning by the drug in the form of a 10% solution taken orally two to three grams. 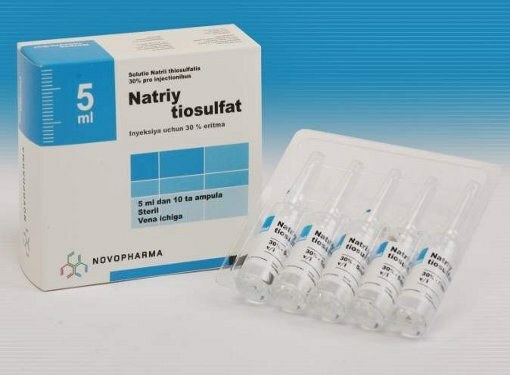 Intravenous 30% solution "sodium Thiosulfate" in the amount of 5-50 ml. The exact dosage is determined by the doctor depending on the type and severity of poisoning. For the treatment of poisoning with cyanide "Sodium thiosulfate" combine with "sodium Nitrite" and "sodium Hyposulphite". It is necessary to observe the patient for 24-48 hours. The return of the symptoms again enter the drug (half dosage). For scabies prescribed 60% solution "sodium Thiosulfate". It needs to be rubbed for 2-3 minutes in every part of the body in the following sequence: left hand, right hand, torso, left and right leg. The whole procedure should take 10-15 minutes. Then make a break, during which the solution on the skin dries out, and it appears the crystals. This was followed by another rubbing of the solution in the same sequence. After drying on the skin should be applied in the same order 6% solution of hydrochloric acid. We can wash just three days after rubbing. "Sodium thiosulfate" is also used to cleanse the blood and lymph of the body. In this case, for ten days, take one ampoule of the drug diluted in one glass of water according to the following scheme. In the morning for half an hour before meals take half a glass mortar, in the evening for half an hour before the meal or two hours after his drink the remaining half Cup. After cleansing the body "sodium Thiosulfate" in patients with psoriasis much easier condition. Over the course of the drug need to abstain from milk, meat, you must drink plenty of fluids. It is recommended to use the juice from the citrus, diluted with water. After this cleaning has improved the condition of nails, skin and hair, increased efficiency, lost the nervousness, reduces the manifestation of Allergy disappears the craving for alcohol. Side effects, contraindications to the use of "Sodium thiosulphate"
"Sodium thiosulfate" is contraindicated for women during pregnancy and lactation, as well as the detection of hypersensitivity to the drug. "Sodium thiosulfate" for reviews is well tolerated, but in rare cases can cause allergic reactions. The drug can be administered to children, despite the fact that objective controlled studies safety and efficacy of medicines in this group was conducted.